It’s time to check back in with the Ptah-Sokar-Osiris figure. In my last post, I mentioned a few of the condition concerns including a significant darkening over the front surface. The uneven surface poses interesting challenges for cleaning, and there are multiple approaches and methods to consider. Before cleaning proceeds, it is important to understand both the nature of the surface discoloration and the properties of the paint layers. Egyptian objects are not always straightforward, and Ptah-Sokar-Osiris figures have a broad range of condition issues and treatment histories. Check out the British Museum’s online collection for a fascinating look at comparable figures. 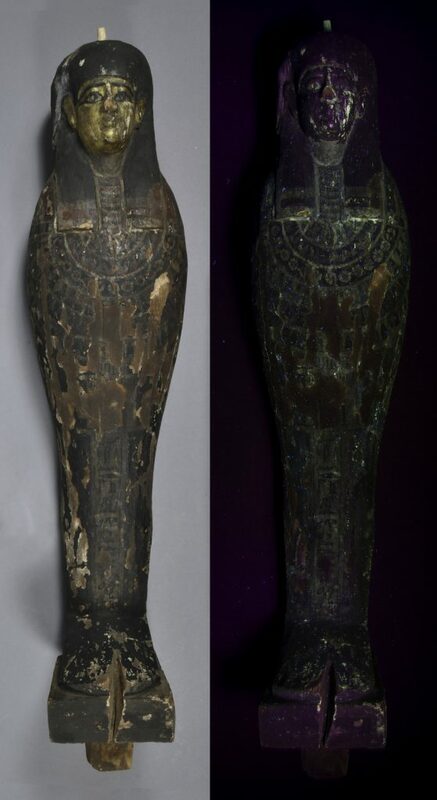 Discolored or yellowed varnishes have been observed on Egyptian painted surfaces, such as the shabti box described in a previous post. One way to assess surface discolorations is ultraviolet (UV) light illumination, a non-destructive lighting technique. In the UV portion of the energy spectrum, aged coating materials including varnishes and adhesives often fluoresce brightly. Areas that absorb more UV light appear darker in comparison. For this figure, areas of fluorescence do not appear to correspond to the pattern of discoloration, which is most noticeable on the platform under the feet. L-55-29. In normal light (left), you can see the darkened surface of the front of the figure. In ultraviolet (UV) illumination (right), specific areas fluoresce. The pattern of UV fluorescence does not correspond to the discolored areas or suggest an overall coating. Additionally, the surface darkening extends over large areas of damage and paint loss, suggesting that it occurred later in the object’s history. In an attempt to understand the darkened surfaces, I will take cross-section samples, which involve tiny (less than 1 mm) flakes of the paint layers. By looking at the edge of a paint flake under magnification, I can observe the stratigraphy from surface down to ground level. One way to visualize this technique is to think about slicing a cake to see the layers inside. 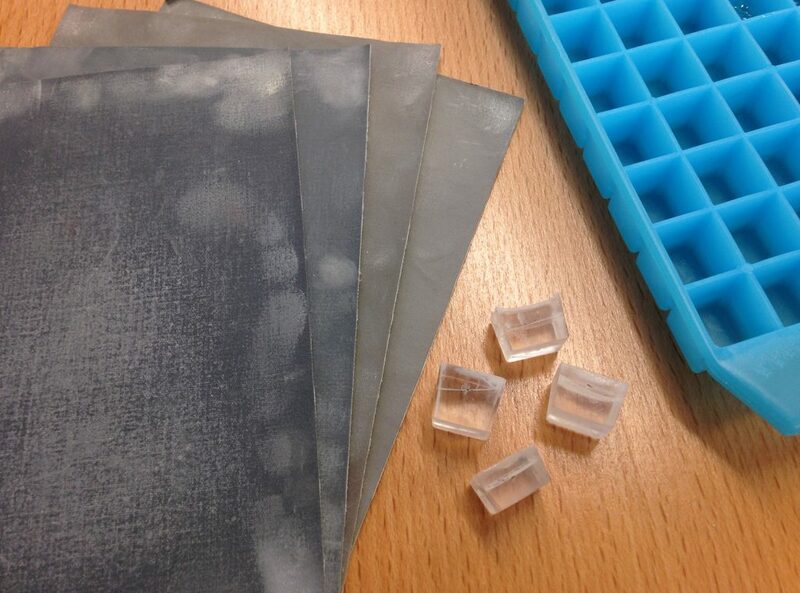 To make handling tiny paint flakes easier, they can be mounted in resin for observation under magnification. Through normal light and UV light microscopy, the presence of discrete coating or soiling layers may be observed. To characterize the behavior of the paint layers, solubility tests were conducted under magnification with small amounts of solvent on cotton swabs. For this painted figure, surfaces appeared to be water sensitive but relatively stable in other solvents. This finding is consistent with typical Egyptian paint binders such as gums or animal glues, which are both water sensitive. Once I know what affects the original surface, I will be able to think about designing a strategy to reduce darkening while avoiding disruption of the paint layers. Dry surface cleaning is one of the first methods to test for a water sensitive surface. Cosmetic sponges and soot sponges lifted significant dirt and grime, although the appearance of the figure’s surface was not visibly improved. Water-based solutions and small amounts of solvent were tested in discrete locations to assess their efficacy. Water-based, or aqueous, cleaning solutions can be adjusted with buffers and chelators to more effectively lift dirt and break up staining. Chelators, such as citrate and EDTA (ethylenediaminetetraacetic acid) are complex ions that attach to metal ions, a key component of most types of dirt. A citrate solution at pH 8 was found to be very effective for lifting dirt and staining, but I wanted to minimize surface interaction with water. One method to manipulate these interactions is to work through silicone materials. Silicone gels, such as Velvesil Plus, can from stable emulsions that hold aqueous solutions. Silicone solvents, such as cyclomethicone D4, can saturate surfaces and act as a barrier layer to protect from water. Testing dry surface cleaning with a cosmetic sponge on the figure’s base. Testing aqueous cleaning solutions to reduce discoloration with a small cotton swab. Could this be used as an overall cleaning solution? A larger test area suggested that the combination of materials, when applied carefully with brushes and worked over the surface, lifts dirt without visibly disturbing paint layers. However, the cleaning effect is slightly uneven, which raises concerns about whether this technique will significantly improve visibility and legibility of surfaces. Since this object is a long-term loan from the Philadelphia Museum of Art, continuing discussion with the PMA senior objects conservator, as well as Penn Museum curators, will help clarify these decisions. In addition to aqueous cleaning methods, I researched the feasibility of laser cleaning. Conservators have successfully employed laser cleaning in many scenarios where discrete layers of soiling need to be removed from surfaces. For Egyptian artifacts, some of the primary challenges include fine control over complex surfaces and slight yellowing after cleaning. While the literature suggests that laser cleaning is unlikely to be the right solution in this scenario, we decided to experiment with a mock-up test panel to gain a sense of the technique’s future applications in the lab. 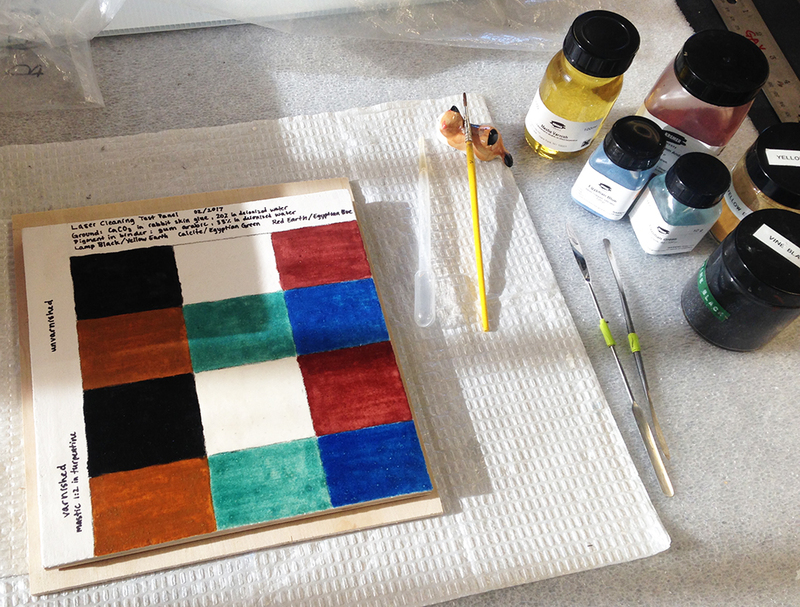 This involved gathering typical Egyptian pigments, including the famous Egyptian blue and green, and mixing appropriate binders to mimic historic surfaces. The panel consists of an animal glue ground with gum arabic paint, coated with an additional layer of mastic varnish for half of the test areas. Mastic, a plant-based resin, is comparable to traditional Egyptian resins such as pistacia. After adding a little bit of “dirt,” a sticky mix of starch powder and pigments, I am ready to start exploring the efficacy of our laser cleaning system for painted surfaces. Creating a mock-up panel to test laser cleaning on painted surfaces. Materials include Egyptian pigments mixed with gum arabic binder, an animal glue ground, and mastic varnish. Korenberg, C., M. Smirniou, K. Birkholzer. 2008. Investigating the use of the Nd:YAG laser to clean ancient Egyptian polychrome artifacts. 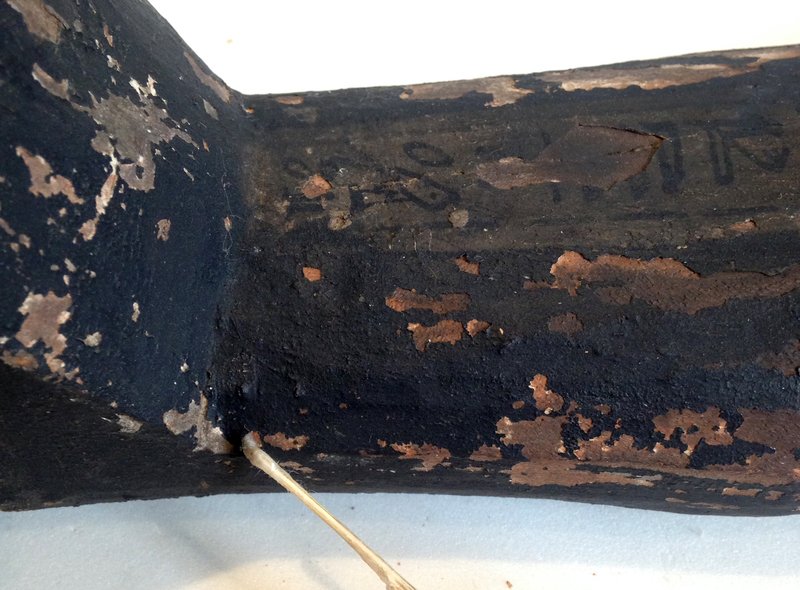 Lasers in the Conservation of Artworks: 221-226. London: Taylor and Francis Group. Larochette, Y. 2012. Wolber’s world: A review of a textile wet-cleaning workshop held in Oaxaca, Mexico. Western Association for Art Conservation (WAAC) Newsletter 34(1): 24-26. Roundhill, L. S. 2004. 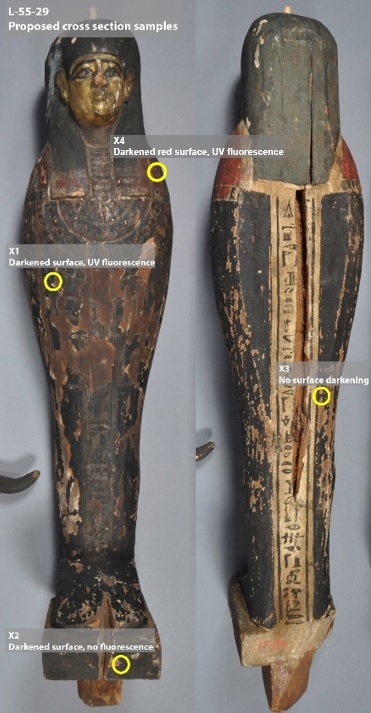 Conservation treatment considerations for an Egyptian polychrome wood coffin. Objects Specialty Group Postprints 11: 89-102. 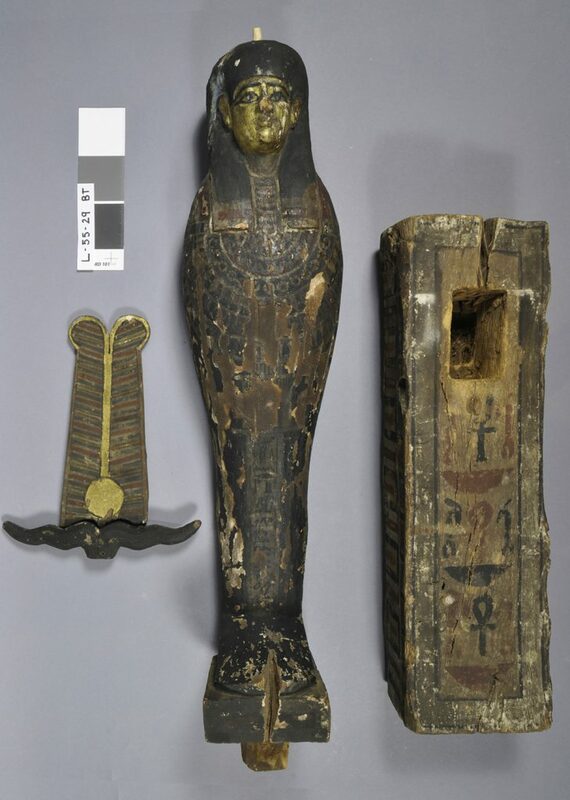 As a conservation intern working in the Artifact Lab, I was able to go shopping through shelves of Egyptian objects and scope out interesting treatment projects. A painted wood statue, depicting the composite god Ptah-Sokar-Osiris, immediately caught my eye. The figure has intricate painted designs decorating the mummiform figure and its base, as well as gilded details in the face and headdress. High-status burials in 19th dynasty Egypt often included this type of mummiform statue. Comparable examples of the popular object type exist in collections worldwide, such as the British Museum and the Metropolitan Museum of Art. Common characteristics include carved wood, a preparatory gesso layer, polychrome design, and in some cases, a coating of varnish. Ptah-Sokar-Osiris statues also frequently feature small compartments carved into the wood figure or base. These cavities could contain small papyrus scrolls or textile wrappings. While examining the object with this in mind, I noticed a faint rectangular shape on the reverse of the figure’s head. X-radiography, a non-destructive imaging technique that helps clarify construction details, was perfectly suited for the question of the compartment. 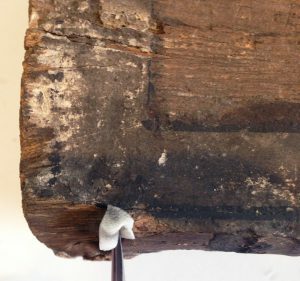 Without disturbing the delicate painted surface, we were able to observe that a rectangular cavity is in fact cut into the head of the figure. 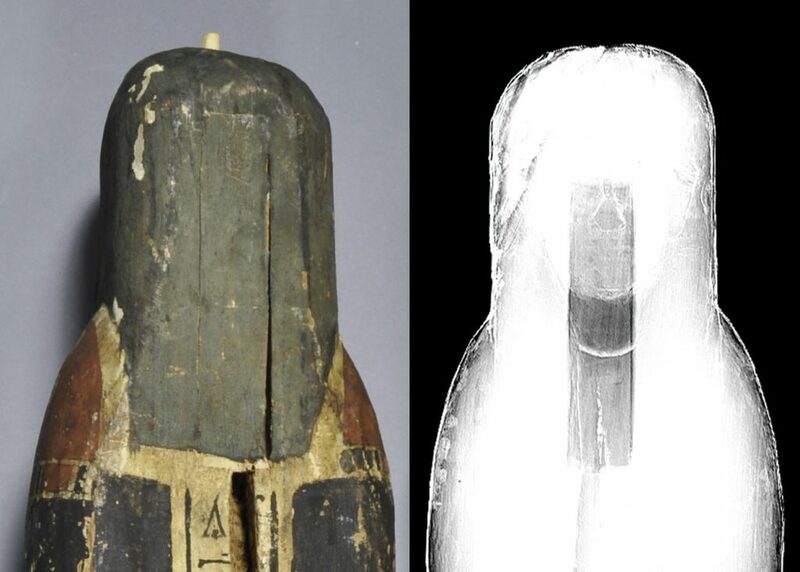 Although the cavity appears to be empty, this interesting construction detail is consistent with similar Ptah-Sokar-Osiris figures. L-55-29A detail (left) and X-radiograph (right). Image captured from 55 kV, 2 mA, and 6 second exposure. The statue has several condition issues, such as actively flaking paint and significant darkening over the front surface. Additionally, the figure is unable to stand upright in the base, and the components do not fit together securely. Upcoming treatment aims to address these issues, and I will be searching for the right approach to cleaning and consolidation. The complex surface made of wood, gesso, and paint will require detailed testing to find appropriate solutions. To further investigate painted surfaces and possible coatings, I used multispectral imaging (MSI), which incorporates multiple light sources to reveal details that cannot be seen in visible light. Interesting findings included the presence of Egyptian blue in the figure’s wig and broad collar, as well as the headdress. This pigment shows up in visible-induced infrared luminescence and is easily distinguishable from surrounding pigments. 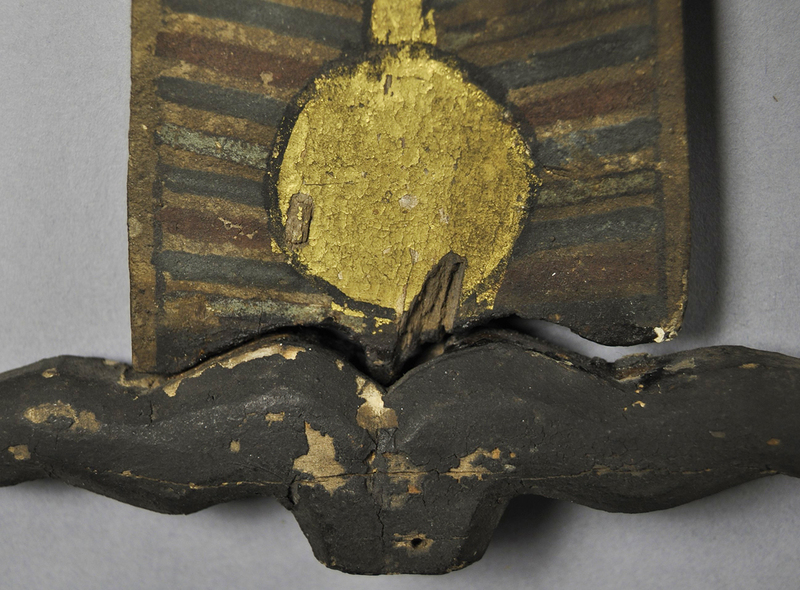 Detail of multispectral imaging, highlighting Egyptian blue pigment. 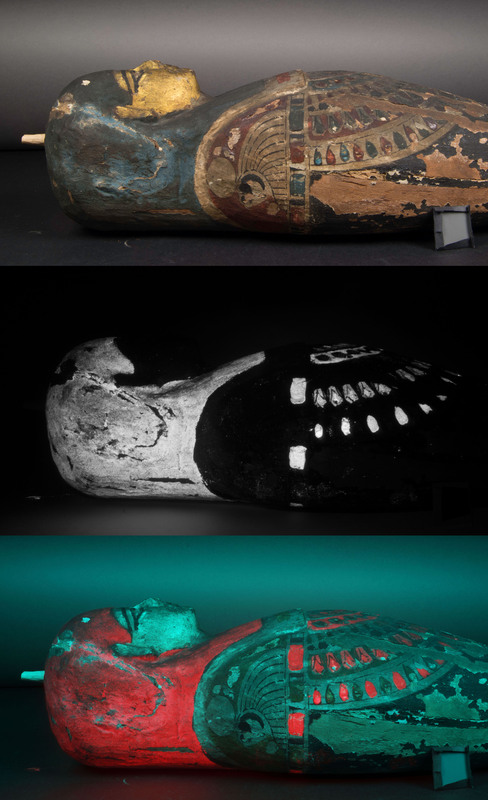 Normal light (top), visible-induced infrared luminescence (center) with Egyptian blue shown in white, and false color image (bottom) with Egyptian blue shown in red. Learning more about the object’s structure and surface will help inform treatment decisions about this complex figure. Check back to see what else we learn and how treatment will proceed!